The summer has been crazy! Keeping 3 kids fed, entertained and from killing eachother is a lot of work. Especially since it's been over 100 degrees almost every day since June started. I am exagerating a little, but not too much. It's been in the mid to high 90s. Even at night! I can't ever open the windows and get a cool breeze. The first week of Summer we signed Logan up for Swim Lessons and he completed his two weeks with so much more confidence! He can do two body lengths of the breast stroke, back stroke, and is happy to dive for our Pirate Jewels. This was a huge step for him since he was scared to put his face in the water before. We bought he and Dustin and it's like night and day with these boys the difference it made. Even Dustin is happy to put his head under water now (although he is less confident in the water than Logan). Brooklyn has become mobile and we better watch out for that one! 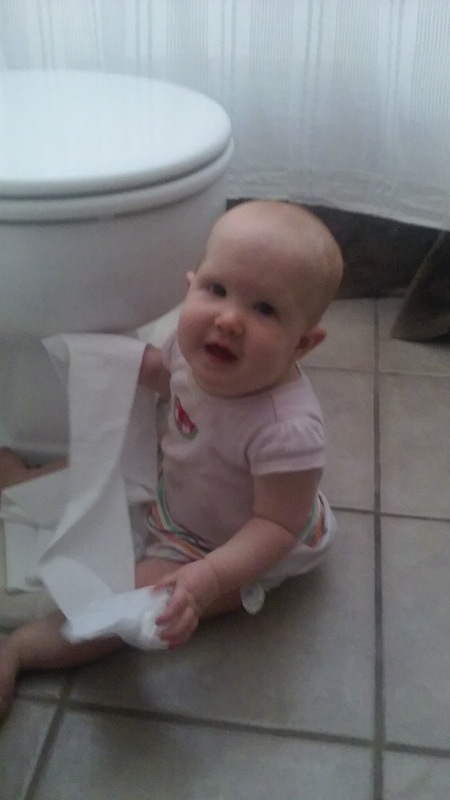 She's found the toilet paper and toilet (although she doesn't know how to open the lid yet). 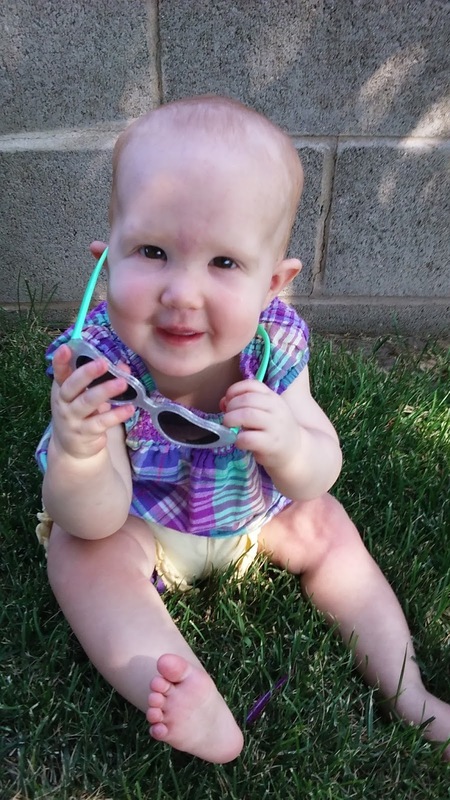 She has what the boys call her super fast crawl. She can get anywhere and into all kinds of trouble. 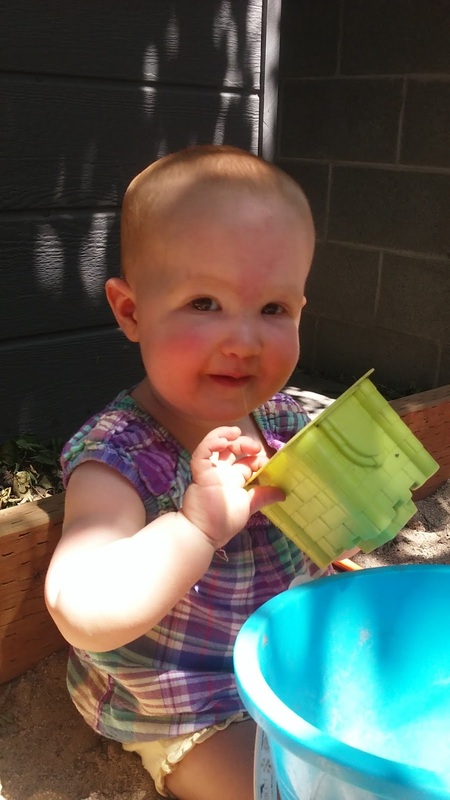 But she's so dang cute we don't mind too much. She also knows how to climb a full flight of stairs which scared me to death. She's fine as long as she isn't distracted mid climb. We have spent a lot of mornings playing outside since by about 11 it's too hot! She loves the sand box and tolerates the kiddy pool. The boys on the other hand LOVE playing in the pool especially with their Dollar Tree water squirters. 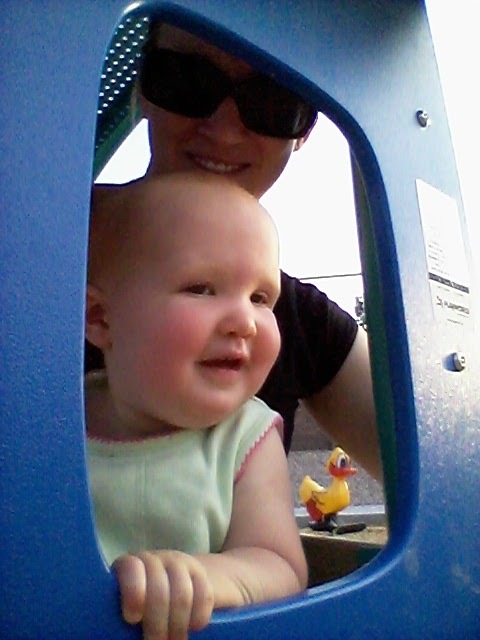 We got a new park in the neighborhood!!! It's right by our church and about .8 miles from our house. We've enjoyed it about once a week. We try also to do the splash pad twice a week to switch things up a bit. It has more play structures that I expected, and we've loved it. 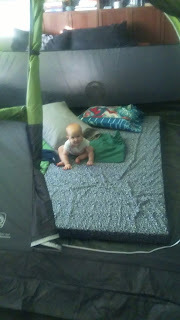 This summer we also purchased a new tent since the demise of our one day old tent at last year's Yoder reunion. We've slept in it in the Living Room twice and look forward to trying it out in the Mountains for the 24th of July weekend. She is so stinking cute! Can't help but take pictures of her. After this week Brooklyn decided she hates hair bows and I can't get her to wear them any more. Whenever I try we all fawn over her cuteness. Maybe it's not the bow but the attention she hates. 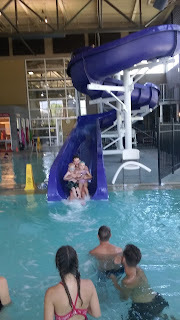 In June the kids and I went down to Zions for 3 days at the Yoder Reunion. 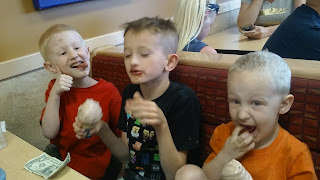 I think we ate Dairy Queen every day we were there. 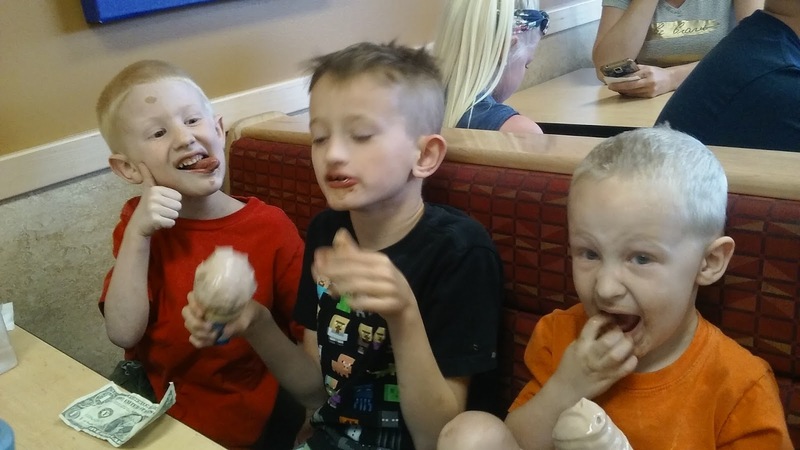 It was hot, but the boys sure had fun playing with their cousins the entire time. There was always something fun to do and delicious to eat. My little explorers loved hiking to the Narrows! And they were champs at keeping up with everyone else since Mom had the Baby in her backpack. Logan had tons of fun with Max and Rea exploring all the rock islands and logs. The kids were so proud to make it out to this rock! It was a difficult climb to the top! When I was taking pictures of this, Logan slipped down the rock and fell in. But he was so brave! His head popped right out of the water and he started swimming to Papa Mike! And the water was COLD. That right there made me glad to pay for his swimming classes. There were crazy chipmunks where Grandma Sheila, Alison, and I were sitting with the babies. They fearlessly tried to steal our food. Dustin was the best at squirting them "in the eye" with a water bottle to get them to go away. We would point one out to him and he would chase it down, squirt it, and continue squirting until the thing was MILES away. For the 4th of July we had a BBQ with burgers, shrimp, grilled pineapple and all kinds of delicious foods! Dave and I were in food heaven. 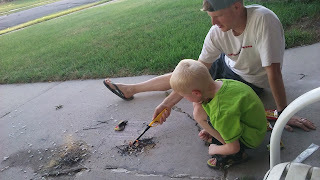 We lit off some fireworks, and Dave taught the boys to light the saw dust from packs of pop-its on fire. They had fun in the 100 degree weather. The boys were excited to pick out their own fireworks this year. They noticed the fire work stands while we were grocery shopping and when Dave got home we went back to get what they wanted. 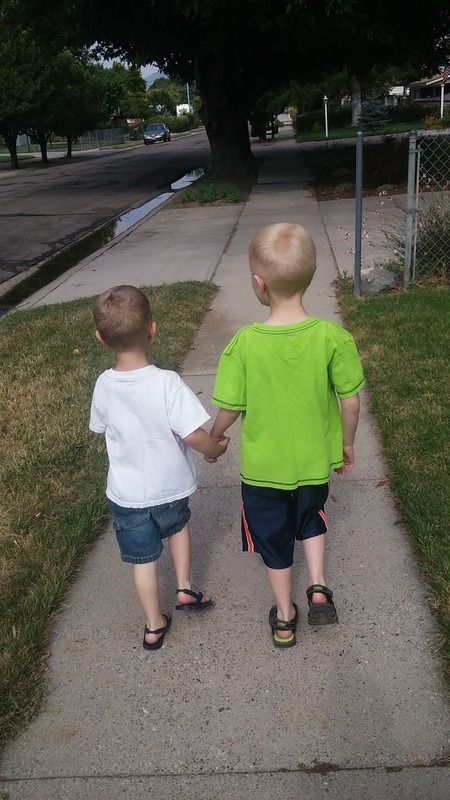 Logan and Dustin are the best of friends and it's fun to watch. They'll be playing and Dustin will just say "I sure love you Logan!" They'll hold hands on most of our walks, and they are pretty good at helping each other (even helping each other get into trouble). They still fight, but mostly they're happy to have a brother. Dustin is hilarious! Some of the things that comes out of his mouth just cracks me up. Last week he put on some Chapstick and turns to me and exclaims "I look GORGEOUS!" He has been going through clothes like candy lately. Summers are messy. So yesterday he decided to save some time and put on all his shorts and undies on. "That way when I get this pair messy I'll just take them off, and I've already got my next pair on." Needless to say I'm doing a ton of laundry. 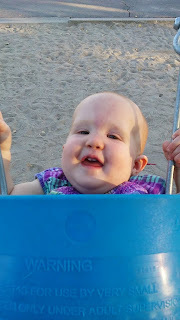 This little girl loves to swing! 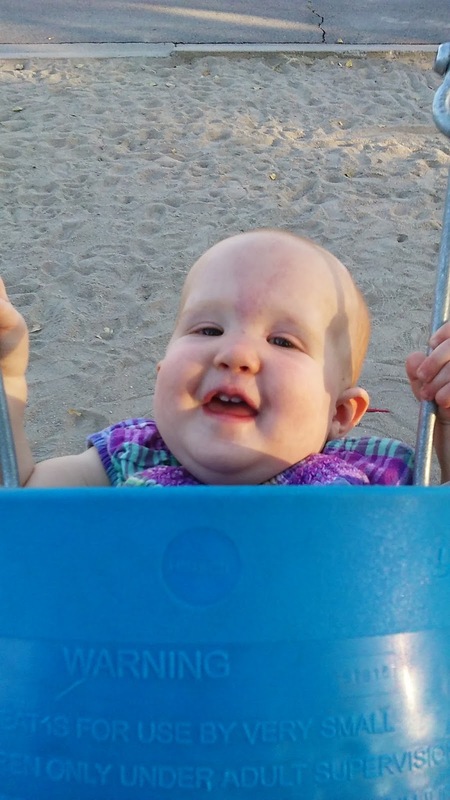 She laughs almost the whole time she's swinging and more than once she has happily swung until she started falling asleep. Oops! But she loves it, so what can you do? Yesterday Logan told me "Summer is fun, but I think I'm ready for school to start. I like school." Which is good! It took him 6 months to tolerate school, so I'm glad to hear he actually enjoys it sometimes.